Elisha Mitchell, 1793-1857 Arguments for Temperance; A Sermon Addressed to the Students of the University of North Carolina, March 13th, 1831, and Published by Their Request. 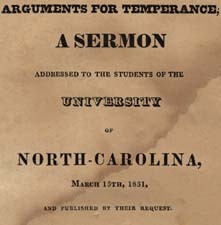 Arguments for Temperance; A Sermon Addressed to the Students of the University of North Carolina, March 13th, 1831, and Published by Their Request. Raleigh: J. Gales & Son, 1831. Sermons, American -- North Carolina -- Chapel Hill.